The green economy presents remarkable prospects for Canadian employment and economic growth. Defining the Green Economy was the first critical step in solidifying a Canadian definition of the green economy and green jobs. The findings from this ground-breaking study set a foundation for further research into the economic opportunities and challenges that lay ahead. 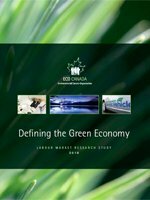 ECO Canada’s subsequent research on green jobs is based on the conclusions reached in Defining the Green Economy.